For this month's "Maps Of The Month" featurette, I wish to draw your attention to Peardian's Wario Land 4 (GBA) maps. Wario's on the search for riches and treasure...again. Investigating a legendary pyramid takes Wario on his fourth portable adventure, and the first original 2D platformer from Nintendo for the GBA. What became evident very early on with the Game Boy Advance was that it was very much like a handheld Super NES. And while there were some Super NES ports (now in portable form! ), what was more exciting for those who had already lived through the 16-bit console era was a whole new games library of Super NESesque games! Sure, 3D games are great, but there's a certain charm to brightly-coloured 2D sprite-based platforming games. Wario Land 4 is one of those games. How can you NOT love the colourfulness of the Pinball Zone, or the exoticness of the Arabian Night, or the duality of the Fiery Cavern? (Yes, that's the Fiery Cavern in the screenshot!) There are big bosses, challenging platforming, and lots of treasure to collect. Peardian, practically the go-to guy for all things related to Mario, does it again with this Wario game. With these maps helping you (and Wario), the Golden Diva's as good as defeated! 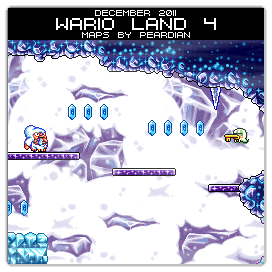 So to recognize the effort in mapping this not-so-micro game, Peardian's Wario Land 4 (GBA) maps will be known as VGMaps.com's Maps Of The Month for December 2011. Ah I know this game! I just didn't realize there were maps for it. I always loved the Wario Land games (except for the 3rd one which I barely played) but I never finished playing this one. With these maps, I really have no excuse not to right? This game was a wild ride to map. Always something interesting to mix things up. And yes, you should really finish playing it. Definitely one of the best games on the Game Boy Advance. As for Wario Land 3, try giving it another shot. At first, I thought it was pretty weird and a little disappointing. But after I discovered that all of Wario's abilities were still there (and then some), it grew on me. I even went on to get 100% on it. Sounds like Japan and Australia can now get the ten GBA games that 3DS Ambassadors (like myself) can download for free. Availability to the rest of the world should hopefully follow. I already have things to say about each one, without having downloaded them to the 3DS yet, but I'll save that all for "What Games Are We Playing" or other topics. To keep on track, with Wario Land 4 in particular, despite my claim that "there's a certain charm to brightly-coloured 2D sprite-based platforming games", I've actually restarted this game three times and didn't get very far for whatever reason. Now that I'll be getting it for free again, on a handheld game console that I am now accustomed to carrying everywhere, I have no excuse to play and finish this game.